Westfield choir were asked by Wigan Council to join in the official ceremony and celebration of Commonwealth Day. The Commonwealth is an association of 52 independent countries totalling 2.2 billion people. The ceremony was led by the Lord Mayor, Councillor Billy Rotherham. Part of the ceremony required the children and other people present to read a pledge to the Commonwealth. Some of the children held the Commonwealth flag whilst the others waved hand held flags of all the Commonwealth nations. The children were asked to sing a number of songs in front of the Lord Mayor, the leader of the council, Lord Peter Smith, Commonwealth representatives, parents and the public. The singing took place in the Library and attracted attention from the library users and council staff. The children were honoured to be able to use the Lord Mayors chamber to warm up prior to the ceremony. 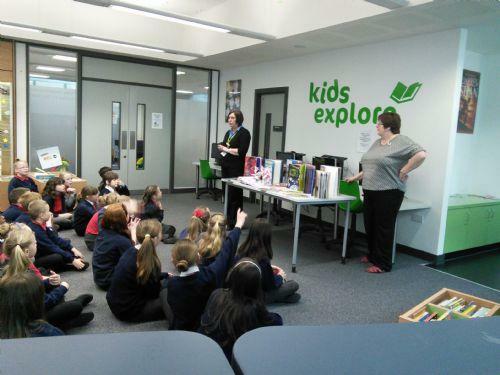 After the singing the children were given a talk about the Library by Kathy and Carole, they also had a tour of the Library and an opportunity to read some books and carry out some activities.